For some enthusiastic souls 45 minute workouts never seem quite enough. Thanks to this snug, virtual dugout it's now possible to gear up for a little extra home training. With inflatable goals and small learner balls you don't need a yard the size of Wembley (or even Craven Cottage) to enjoy a light-hearted family kick-about. All teams relish playing a home match in front of their most faithful fans - thanks to Little Kickers your child can enjoy home advantage every day of the week. Customers details collected will only be used for processing the order and not for any other purpose. Little Kickers and Little Heroes, a personalised children’s book publisher, collaborated to produce a football-themed book sure to delight your child! 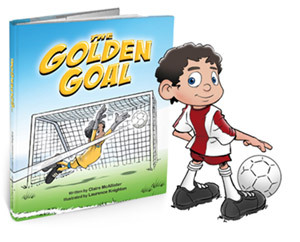 In this personalised book, your Little Football Hero dreams of winning the championship and scoring the winning goal. But playing in the real world is not always so easy. Your Little Football Hero is tempted to give up, but keeps on going to see their team, and themselves, champions of the league! Custom football uniform to match your Little Kickers uniform or any team of your choice! SPECIAL OFFER! - Little Kickers parents get FREE SHIPPING when you buy 2 or more Little Heroes books. Click here to view all Little Heroes personalised children’s books. (children aged 18mths to 2½ years) A quality, breathable (CoolDry™ fabric), hardwearing yet tasteful LKFC® football strip that you won’t mind your child living in!! Part of the unique and growing LKFC® football clothing range, the LKFC® football strip consists of shorts and shirt in four unique designs. The Little Kickers colours are red,white and grey. (to fit children aged 2½ years to 3½ years) A quality, breathable (CoolDry™ fabric), hardwearing yet tasteful LKFC® football strip that you won’t mind your child living in!! Part of the unique and growing LKFC football clothing range, the LKFC® football strip consists of shorts and shirt in four unique designs. The Little Kickers colours are red,white and grey. (to fit children aged 3½ years to 5) A quality, breathable (CoolDry™ fabric), hardwearing yet tasteful LKFC® football strip that you won’t mind your child living in!! Part of the unique and growing LKFC® football clothing range, the LKFC® football strip consists of shorts and shirt in four unique designs.The Little Kickers colours are red,white and grey. (children aged 5 years to 7) A quality, breathable (CoolDry™ fabric), hardwearing yet tasteful LKFC® football strip that you won’t mind your child living in!! Part of the unique and growing LKFC® football clothing range, the LKFC® football strip consists of shorts and shirt in four unique designs. The Little Kickers colours are red, white and grey. SIZE 2: A unique, attractive, specially manufactured, 18 panel, smaller stitched LKFC® football recommended for younger and learner players. This affordable hardwearing practice football is ideal for home use both indoors and out, looks great and makes a great gift for a budding footballer... (requires inflation). SIZE 3: A unique, attractive, specially manufactured, 18 panel, smaller stitched LKFC® football recommended for younger and learner players. This affordable hardwearing practice football is ideal for home use both indoors and out, looks great and makes a great gift for a budding footballer... (requires inflation).